John Edwards was, as far as I know, the first candidate in the U.S. presidential elections with a campaign presence in Second Life (if only an unofficial one). 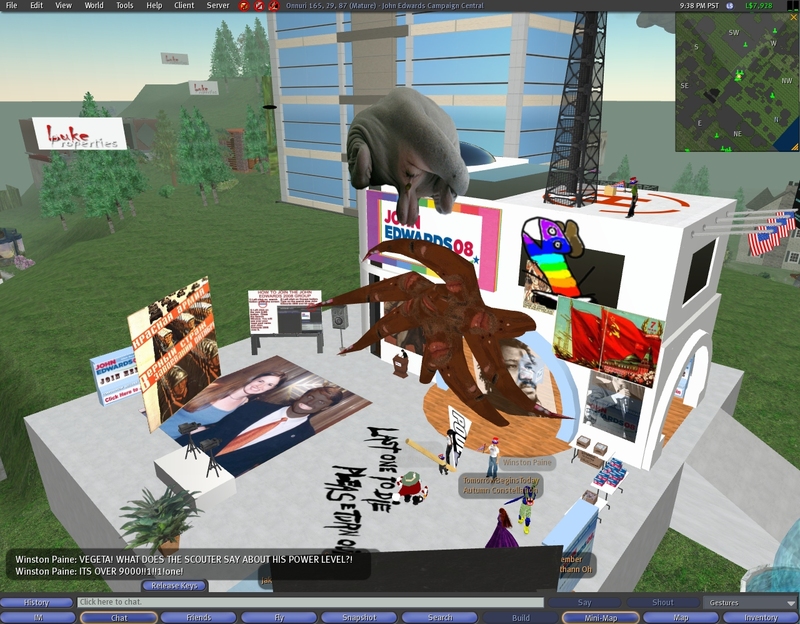 As of yesterday, he’s got another first: His Second Life headquarters became vandalized. Raven Canning: As a professional how would you defend against vandalism like this on a property you were asked to build? Dire Lobo: The solution is a multi-part answer. Dire Lobo: For one, you can just turn on auto-return. Dire Lobo: This would simply return objects that were not created by the owner, but would be a problem for group ventures. Dire Lobo: If you have people contributing content, make them DEED it to you or to the group (if the group owns the land). Then you can use auto-return. Dire Lobo: But you introduce some overhead by doing that and it is fun to allow people to create things as they wish. Dire Lobo: Now for a sensitive project like a campaign, I wouldn’t take that attitude. Dire Lobo: As I mentioned yesterday you can also use the SL programming tools to create a system which monitors not only everyone who comes and goes but can take a catalog of what objects exist – or at least who owns them – and compare that to a list of authorized owners. Dire Lobo: This whole process can thus be automated and allow multiple builders, etc. Dire Lobo: With the tools LL [Linden Labs] provides you can do an awful lot if you know how. This is one potential danger of amateur or hobby 3D sites for candidates. Dire Lobo: In the early days of the WWW the same thing occurred and even now unauthorized web sites for candidates appeared all the time. Dire Lobo: The key is that candidates have to provide an “Official” presence like they provide an “official” web site and this has the be a manned effort and properly managed to present the right message. techpresident.com covers all internet-related campaign activities of the U.S. elections 2008, and what can I say, it’s a great resource. [On Monday] a group of republican Second Life users, some sporting “Bush ’08” tags, vandalized the John Edwards Second Life HQ. They plastered the area with Marxist/Lenninist posters and slogans, a feces spewing obsenity, and a photoshopped picture of John in blackface, all the while harrassing visitors with right-wing nonsense and obsenity-laden abuse of Democrats in general and John in particular. Update: There’s a screenshot here as well, also directly from John Edwards’ blog (click image for full size screenshot). Not that I’d propose vandalizing any campaign headquarters, but I wouldn’t exactly call this abusive as much as political satire. As much as I like Second Life, let’s not forget that it’s just a game. Sort of. You know what I mean.